Is there a better alternative to Ekushey Unicode Bangla Keyboards? Is Ekushey Unicode Bangla Keyboards really the best app in System category? Will Ekushey Unicode Bangla Keyboards work good on macOS 10.13.4? Ekushey Unicode Bangla Keyboards is a complete unicode Bangla solution developed to work systemwide. This package contain 2 unicode Bangla fonts and 2 keyboard layout. The fonts developed for the package are developed using Apple Advance Typography (AAT). So, these fonts work systemwide almost seamlessly. All Cocoa applications support AAT by default. 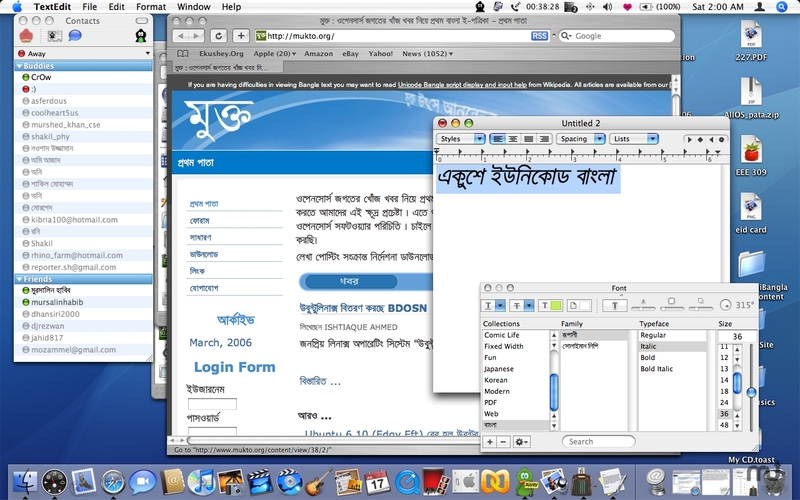 Some Carbon applications developed using Apple Type Services for Unicode Imaging (ATSUI) also support Ekushey's Unicode Bangla fonts and keyboard layouts. This is the first Bangla Unicode Bangla System that works properly under Mac OS X.
Ekushey Unicode Bangla Keyboards needs a review. Be the first to review this app and get the discussion started! Ekushey Unicode Bangla Keyboards needs a rating. Be the first to rate this app and get the discussion started!